International orienteering competitions is organised as according to the Rules of International Orienteering Federation. Other than specific rules set by local organisation, all orienteering competitions around the world refers to the same Rules. Orienteering in Hong Kong and many major orienteering competition adopt the International Orienteering Federation standard control description symbols. Break the route into small section, and move from one large feature to another. Select safer routes, especially in the beginning. Use trails more often than you normally do. Slow down and concentrate more on navigation and observing features. Use compass is vital. Navigate to direction that the light beam reaches. Always know where you are. Not so easy by compass bearing to see features in distance at night. Do not rely too much on point features, such as boulders, are much harder to see at night, since you have to be closer to them to spot them. Use pace counting - it would seem to take longer to cover a given distance at night compared to daytime navigation. You may need to add about 10% to your daytime pace count in dark environment. Select two lights that the luminous intensity can last for the whole competition period. LED lamp has larger luminous intensity and use less battery power. Headlamp is good for running and holding map. Hand electric torch is good for scanning around the surrounding for target objects. Lamp with wider and brighter light beam is good for moving forward. Map reading needs a softer light. Wear a headlamp with wider and softer light beam is easier for map reading, and hand held an electric torch with stronger light beam for finding target. Fully charge the battery or bring with spare battery. Always bring with a spare lamp when the main lamp is faulty. Your vision at night shrinks down to a small sphere of light. Relocating is much harder at night than during the day. You have fewer features to use to help relocate along the way, since you can't see too far away. Look for features you can check off that are within the beam of your headlamp. When running a bearing, use the "two trees" method, unless you can find a fixed light off in the distance. Headlamp light beam will cause glares effect on spectacles. People who wear spectacles wear a short peak cap can have clearer vision for map reading. 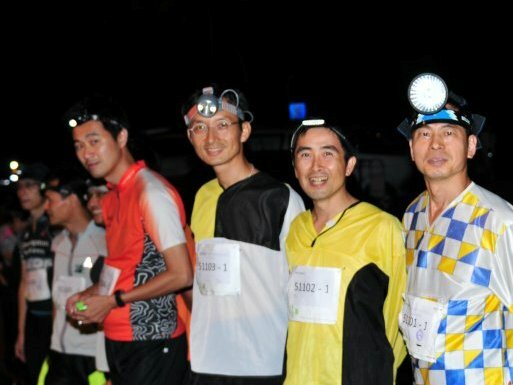 Each runner shall have his/her own lighting and compass, whistle. Pick safer routes with large, obvious features such as hilltops and path. Wear eyes protector and wear cap prevent scratches on face by small tree branches. Careful of tripping by tree branches on ground. If you feel get lost, slow down or stop to really think about it. Don't lost contact with the map! Avoid pointing light beam direct to other people eyes when using high energy LED lighting. This may cause temporary blindness and consequential accident. The followings are common exercises that can be found in orienteering technical training and practice events. * Source of demonstration map in this section from O-training.net. 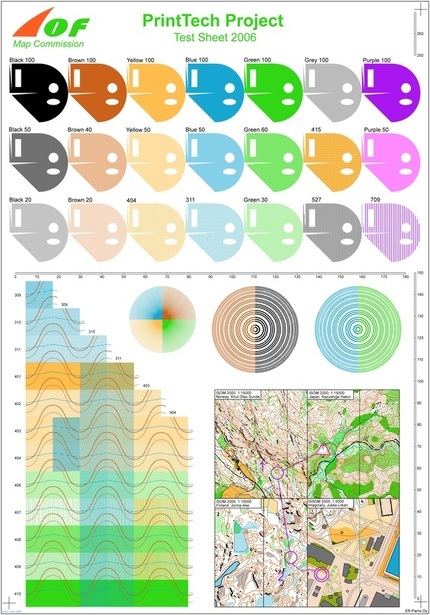 This is a exercise with use of a map that only shows the brown colour terrain features of an orienteering map, that is only with contour lines and other terrain features. 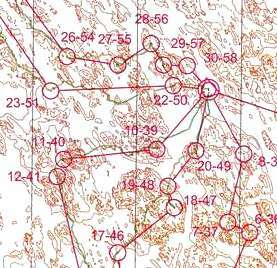 The orienteer must focus on the contours in orienteering as this is the only information on the map. This exercise reinforce contour line reading ability and concentration. Without any display of runnability of vegetation, this is more appropriate to have a fairly open forest terrain to do a brown map exercise. There may add on information of some obvious impassable features and key locating features for orienteer with less experience. 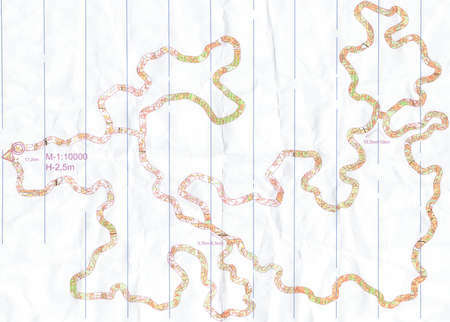 This exercise use a map that only show the map details in a narrow strip corridor of 50-100 m wide on ground. Other area outside the corridor is blank on map. 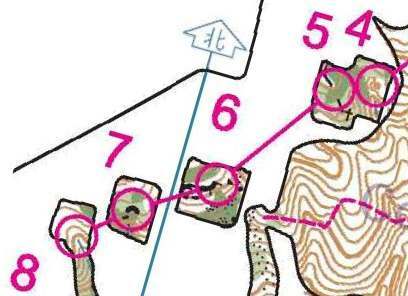 The orienteer needs to stay inside the corridor during navigate through, with use of control points or GPS to verify how far the orienteer can stay within the corridor. With a course with control points along the route make the training more interesting. This exercise train the detail map reading of fine details that may not be used in normal orienteering. 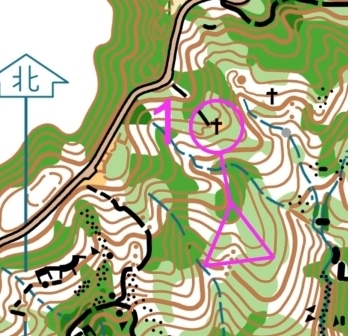 This exercise requires the orienteer to run along a route as show on a line marked on the map. If the orienteer can maintain along the route on ground the orienteer will find the the control point or verify the accuracy with a GPS to trace back the actual route of running. The exercise train on accuracy of detail map reading. The difficulty of this exercise can be adjusted by varying the terrain, the intensity etc. go through for different skill levels of orienteer. This exercise require the orienteer run without a map. The route ahead to the next control points must be memorized before leaving to next control. This train an orienteer on map reading skill on selecting key features from a map for navigation ahead and memorising it. Map example is from a HKOC practice event. Before starting a normal orienteering course, plan ahead the route into three sections of green light - amber light - red light. Green light is the section that can run fast without too much attention on terrain details until arrive a point of an obvious feature. Then in the amber light section where require some attention in terrain features to prepare for approaching to the control point when arrive an attack point to the control. Finally, in the red light section area a fine orienteering require detail attention and slow down in order to find the control point. 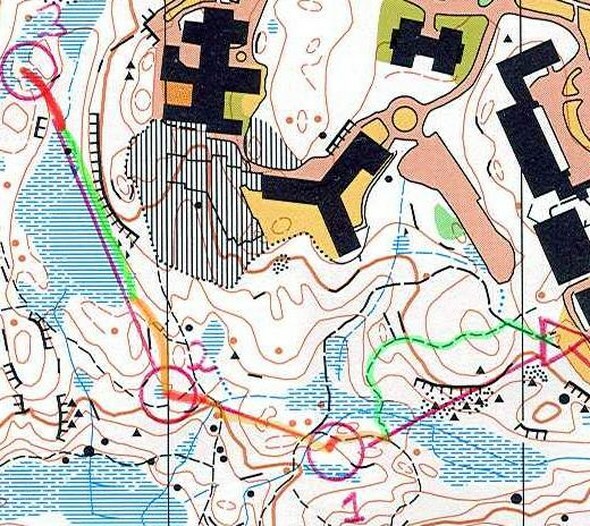 This is a good exercise to train a variation of navigation concentration and speed control and it is a common technique to be used in orienteering competition. Similar to Corridor Orienteering, this exercise use map shows only the area around the control points,other area is blank on map. Area between two control points are hidden or shaded. The orienteer needs to run in straight line to the next control. 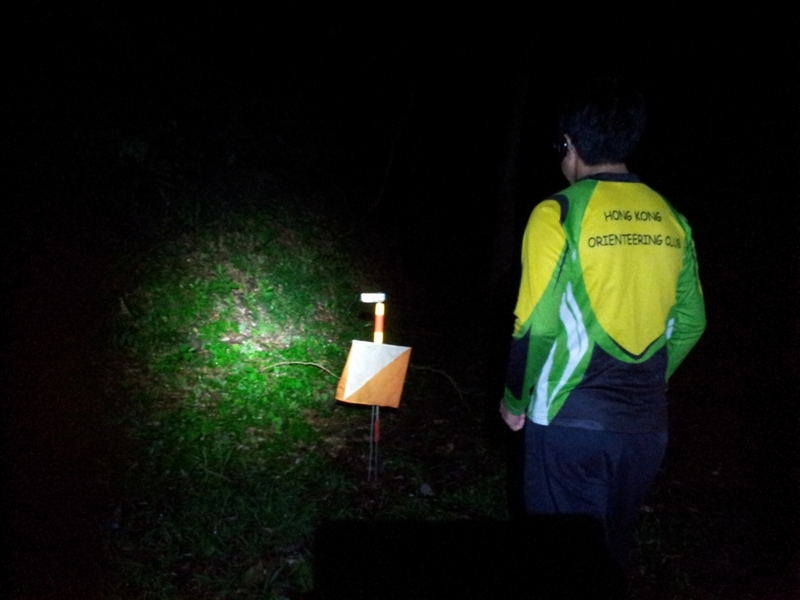 This training ensure the orienteer with very good bearing running and cross country ability. Map example is from a HKOC practice event. This exercise consists of course with many short legs and changes in direction. Runner requires accurate map reading skill while running and quick response in the flow of entering and leaving controls. This exercise may also running with a brown map.